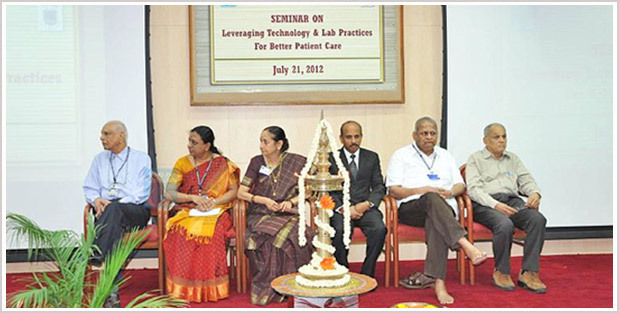 The seminar entitled Leveraging Technology and Lab practices for better patient care was conducted on the sat, 21st July 2012 at the VD Swami Auditorium under the aegis of The SN Academy and was organized by the Sri Nathella Sampathu Chetty (SNSC) clinical laboratory. The Ortho Clinical Diagnostics, a division of Johnson and Johnson sponsored it. Dr.S.B.Vasanthi, Director The SNSC clinical laboratory inaugurated the seminar by lighting the lamp. Dr. S.Baskaran, chairman, Sankara Nethralaya, gave the inaugural address. Ms.Akila, Registrar, The SN Academy delivered the welcome address. Dr HN Madhavan, President Vision Research Foundation welcomed Dr.S.S.Badrinath, our chairman emeritus. Dr Cherimaraj, Tech Manager, Johnson and Johnson was the chief guest who was honored. The technical talk by the chief guest was on the micro slide technology in the routine clinical diagnostics introduced by the Johnson and Johnson as the ‘Vitros” machine. Ms Sonal, from Johnson and Johnson gave a talk on the Error and bias calculations in the quality control. Dr.Shanti Naidu gave an update on the cardiac markers namely the troponins and the naturitic peptide. She elaborated on the cross talk between the heart and the kidney in cases of myocardial infarction and the diagnostic importance of cardiac bio markers. In the post lunch session, Dr KLT gave a talk on the EQAS in Microbiology and Dr.Pandian on the genetic testing at SN. Finally, Dr.Sujatha talked on the value of genetic testing in diagnostics, therapy and counseling. All the talks were well received. The participants were the pathologists, microbiologists, biochemists from various hospitals namely MMC, SRMC, MMM, MV Diabetics, SMF, Sri Muthukumaran Medical College, MTR, CTH, MDRF, and various labs like Hitech, and research institutes like PG IBMS, Taramani, and the Mohans Diabetic clinic. There were around 40 registrants from outside including the 4 speakers from outside and the rest were our own faculty and technical staff. Many of the MDs and technical staff who attended visited our laboratory facilities after the sessions. The manual on the laboratory techniques was projected and there were lot of enquiries for the book. Certificate of participation was given to all the participants. Feedback forms were circulated and collected. This was the first time such a meeting was conducted on the diagnostics and was completed sponsored by the ortho clinical diagnostics, division of Johnson and Johnson. 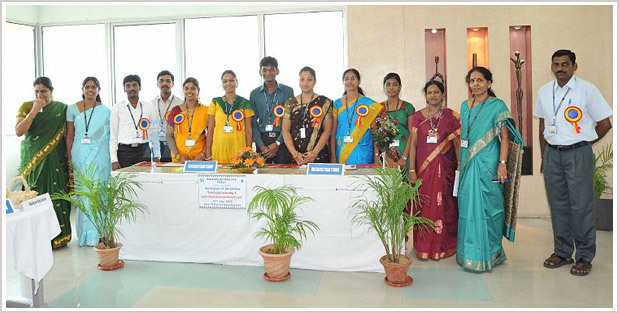 A team of volunteers organized the programme from the SNSC Cl lab represented by members from all the dept of the lab. It was successful programme that was well received. Johnson and Johnson informed that they were extremely happy on the way it was conducted and said it was a success full one. They had procured three “insight” books to be given as memento to the speakers apart from their own mementos given. They had sponsored a jute bag that had information on the technology front of the diagnostics and the SN Academy had also provided information brochures along with. The programme also helped to collect names and address in the field of diagnostics. The BS and MS MLT students had also participated and it gave them an exposure to the world of diagnostics.